TORONTO - Ontario's Progressive Conservative Leader Tim Hudak firmly denied Monday that he had approved a controversial housing allowance claimed by his finance critic, who was fired after refusing to pay the money back. 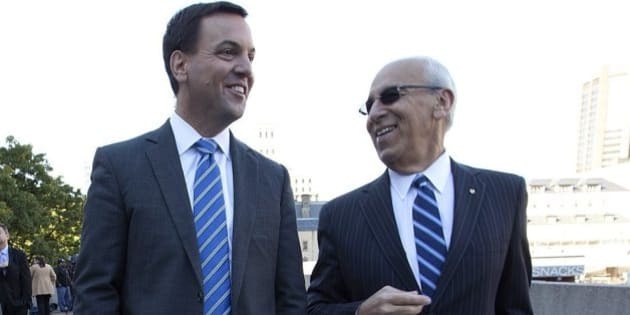 Toronto-area MPP Peter Shurman said last week that Hudak approved his claim for $20,719 last year to subsidize his Toronto apartment after he moved to Niagara-on-the-Lake. "Did I approve these expenses? No," the Opposition leader said. "Was I aware he was billing all these expenses to the taxpayers? No." When Shurman refused to pay back the money, Hudak said he fired him as the Tory finance critic. "He said no, he made his decision," Hudak said of his Sunday talk with Shurman. "I made my decision. He's no longer finance critic." Shurman was also exiled to the Opposition back benches Monday and refused to answer questions from reporters after question period. Hudak acknowledged that Shurman was within his rights as an MPP to take the money, but said elected officials are held to a higher standard even when they follow the rules. Shurman, who represents the riding of Thornhill, just north of Toronto, has apologized for suggesting he needed to make the claim because his salary — about $116,000 last year — wasn't a lot of money. He said he won't bill taxpayers for his apartment any more. The governing Liberals — who were the targets of Shurman's frequent attacks about the abuse of taxpayer dollars — and the New Democrats have accused him of exploiting a loophole in the rules. Shurman's decision to take the money has undermined his party's credibility on fiscal issues, they said. "I think this kind of thing is the kind of thing that raises eyebrows with folks, and that's something that the Conservatives are going to have to deal with," said NDP Leader Andrea Horwath. Liberal house leader John Milloy said Shurman should pay the money back, even though he's not obliged to. "I'm not going to question his personal integrity," Milloy said. "But I'm just going to say:'Look, you can't stand up with the arrogance and the vitriol and attack us over and over again for how we deal with taxpayers' money, and then turn around and have a situation like this.'" Members of all three parties can claim the housing expense if their primary residence, which doesn't have to be in their riding, is more than 50 kilometres from the legislature in downtown Toronto. Cabinet ministers and opposition leaders can claim up to $21,719. All three parties say the rule on Toronto accommodation allowances needs to be changed. "I think in some situations, the letter of the rules or the letter of the law and the spirit of the law are not the same," said Premier Kathleen Wynne. "And I think that in this situation, we really need to look at those rules and make some changes." Shurman, 65, owned a call centre company that he sold in 2003 for about $3 million and worked as a radio talk show host before he was elected in 2007. According to government records, Shurman also owns a private 1979 F33A Beech Bonanza airplane through a numbered company. Shurman had refused requests for comment both Thursday and Friday, with his staff saying he was observing the Jewish holiday of Rosh Hashanah. His only interview was Friday on the Toronto radio station where he used to work, taking questions from his former party leader John Tory. Shurman said he and his wife Carole intended the house to be a retirement home when they bought it in 2008, but they soon realized they wanted to live there full time. He said he informed Hudak when he changed his primary residence and started collecting the housing allowance. "(Hudak) acknowledged that I had told him, and that this was totally within the bounds of not only reason but legitimacy," he told CFRB. "I followed the rules." Questions about the accommodation allowance come amid an expense scandal in Canada's Senate, with allegations swirling that several senators improperly stated their primary residences, which allowed them to claim tens of thousands of dollars a year in living expenses. The Senate — which has tougher rules than Ontario — require its members to have a primary residence in the province they represent. If it's more than 100 kilometres from Ottawa, they can claim a housing allowance of up to $22,000 a year.